LEXINGTON, Ky.—Rotnei Clarke used to live next door to Verdigris, First. Now the church owns his former residence as a rent house. 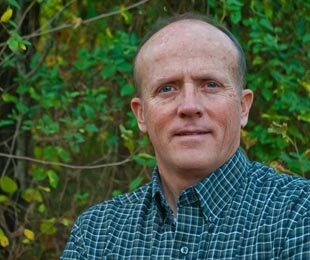 He has fond memories of going to Wednesday night youth group meetings, being among 30-40 kids attending each week and hearing the youth pastor, Dwayne Wright, teach. The life lessons Clarke learned have helped him along his way. He appreciates the Christian influence he received from his parents, Conley and Chris, as well as the close relationship he has with his sister, Cassie, with whom he often exchanges Bible verses via text messages. Clarke will admit, even with different hurdles he has faced in his life, faith has been a key element for helping him endure and overcome. Many remember Clarke as Oklahoma’s high school basketball career scoring leader, playing for Verdigris High School and scoring 3,758 points. He received numerous scholarship offers from schools, including Kentucky and Kansas, but the six-foot guard decided to go to Arkansas. Clarke had great success playing for the Razorbacks. During his sophomore year, ESPN basketball analyst Andy Katz called him “the best shooter in college basketball,” consistently hitting more than 40 percent of his three-point shots. He often spoke about his faith at churches and basketball events around Fayetteville. He also met his girlfriend, Patricia, while attending campus church. However, things changed for Clarke. His head coach, John Pelphrey, was fired, and Clarke consider it a sign for him to transfer. Arkansas never made it to the NCAA Tournament during Clarke’s tenure, so although he had many colleges expressing interest in his transfer, he chose to go to the school that features one of the most renowned arenas in the country and also holds a reputation of making it to the Final Four. Butler University welcomed Clarke to its campus. The Bulldogs have made two recent appearances to the Final Four and claim Hinkle Fieldhouse, famous for appearing in the movie, “Hoosiers,” as their home court. Though Clarke may have found the right program for him to finish his college career, he still faced trials early on at Butler. In 2012, after complaining about pain and limited flexibility in his ankles, athletic trainers concluded he suffered from a bone defect he had since birth. This called for surgery that restricted Clarke to a wheelchair for four months. The gym rat was devastated, as the ordeal prevented him from playing the game he loved. But, the down time allowed Clarke to do some soul-searching and make a profound conclusion. Clarke finally was able to play this season. The senior claimed some early heroics, which include hitting a three-point buzzer-beater to defeat Marquette, 72-71, in the Maui Invitational. 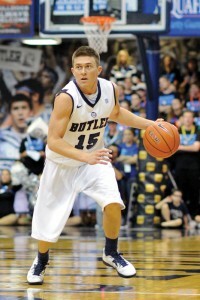 He also led the Bulldogs in upsetting top-ranked Indiana in overtime. Yet again, Clarke’s journey involves hurdles, including a critical one he experienced a few months ago. Playing in a game in January, Clarke was fouled hard while going up for a fast-break layup. He collapsed to the floor where he remained for several minutes. From his neck down, he was numb; his arms moved, but he had no control over the movement. X-rays revealed he suffered a severely strained neck, but no long term damage. Clarke missed Butler’s next three games and was not allowed to engage in strenuous activity such as basketball practice. As soon as he was cleared to play, he went straight to Hinkle Fieldhouse and started shooting jumpers. When he returned to action, he scored 24 points and dished out a career-high nine assists against Temple. Clarke finished the regular season with a 16.7 point per game average and was named Atlantic 10 first-team all-conference. He also led the Bulldogs to the semifinal round of the conference tournament. Along with his success this season, Clarke got to make his first appearance to the “dance,” as Butler was named a sixth-seed in the NCAA Tournament. At the time of publication, Butler’s status of surviving the first and second rounds is unknown, but one thing is certain, Clarke will still be finding a way to play basketball, and as he said, he will do it to glorify God. Basketball and life experiences have taken him a long way from that house next door to Verdigris, First.